There is only one way to truly gauge the success of an appetizer. If you can eat a handful of them and then ask yourself “did I really just eat that many?”, then your appetizer wins. Aspects like presentation, color harmony, mouth-feel, taste balancing, etc. all work together with this one goal in mind: extreme wolfability. (I just made that word up, but I think you’ll agree that a food’s ability to make you wolf it down should be called “wolfability”). All this to say that when we debuted these tiny open-faced sandwiches at a Halloween party this year, they were quickly devoured and much applauded. 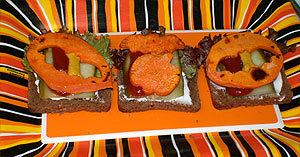 We called them Fried Yam Bats on Pumpernickel Tombstones, but choice of bread is totally up to you. In fact, as always, feel free to get creative with ingredients. 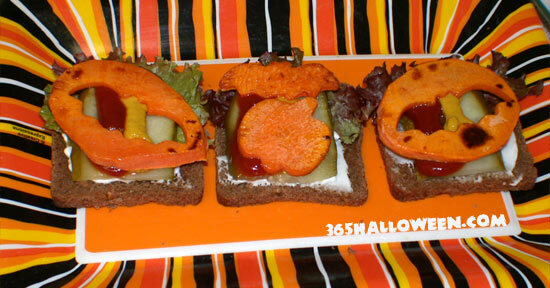 There are actually a lot of colorful Halloween ingredients that would be delicious in a sandwich. Step 1: Prep your yams. Wash and peel them, then slice into discs between 1/8″ – 1/4″ thick. A mandolin slicer is helpful for this task. 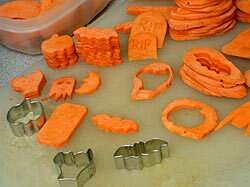 Use mini cookie cutters to chop spooky shapes of your choice into the center of the discs. If you’re feeling creative, use a knife and freehand some of your own shapes. Step 2: Heat up a frying pan with a thin layer of vegetable oil. 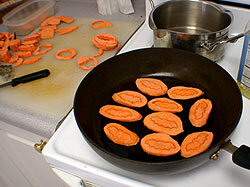 Leaving the shapes inside the discs, fry them up on medium heat until they can be pierced with a fork. They cook quickly- sometimes just 1 minute on each side- so watch carefully. To retain color, don’t overcook or allow too many grilled looking spots to appear (as you can see in some of our finished sandwiches). Step 3: Get out all your condiments, slice your pickles in half and assemble. We layered ours so that you could see each of the colors/ingredients. They went like so: pumpernickel bread -> Veganaise -> lettuce (covers the top half of the bread plus a little over the top) -> parallel lines of ketchup and mustard -> fried yams. 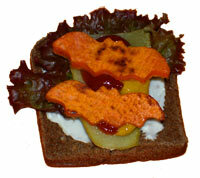 Ta da, cute little spooky sandwiches! Rich in colors and textures, no cholesterol, high in vitamin C and manganese, lots of fiber (veggies and whole grains), and perfect finger food size; what’s there not to like? 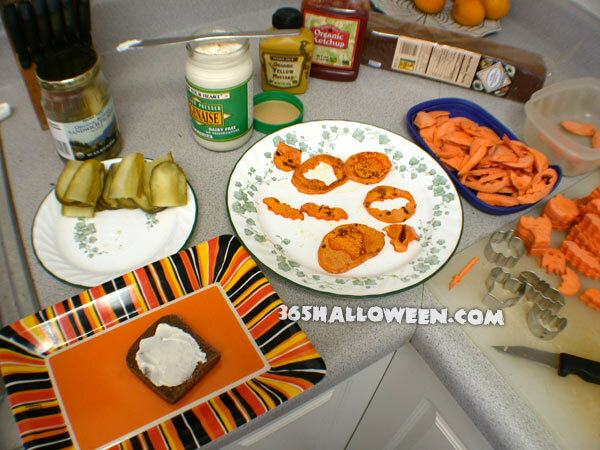 create your own Fried Yam Bat Sandwich Recipe. Subscribe to comments with RSS or TrackBack to 'Fried Yam Bat Sandwich Recipe'. These little open face sandwiches are cute. I love how you used cookie cutters for shapes. I’ve had a fried yam on a sandwich before, so I know it tastes good, but I would have never thought of this. 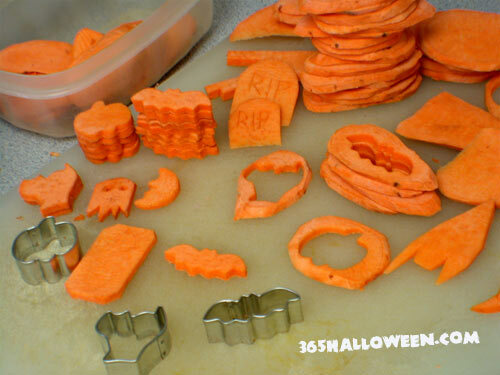 These will be going into my early Halloween party appetizers this year for sure.